You have just received your first Orville and Wilbur Wright card in the mail and you couldn't be more on top of the world; unless you were actually flying. 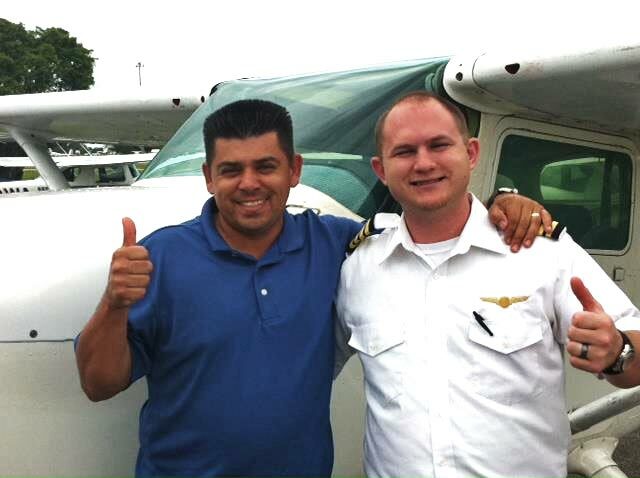 Certified flight instructors (CFIs) understand how thrilling it is to get your first private pilot license. The avionics and instruments in rental aircraft may be different than the ones you trained in. Make sure you know how to use these before flying. If you're not sure how to use new or different avionics you can always ask for help or switch to a plane you are familiar with. If you haven't flown in a few weeks, consider doing a warm up flight with an instructor. You might be rustier than you think. Even instructors lose their flight skills if they haven't flown in a while, so there is no shame in flying the pattern for a few rounds to warm up your skills. It is highly advised to do a warm up flight with an instructor if you have any reservations about your skills. Be extra considerate of safety and comfort-levels when flying passengers. Remember that safety briefing you have to do about seatbelts, fire extinguishers, air sickness and how to exit the aircraft? Yes, you actually have to do that. Always stick to your training and especially if you experience an emergency. You're the one and only PIC now. It's up to you to keep current and chair-fly emergency procedures. If you're on the ground or flying and you have any hesitation of the conditions including storms, haze, clear air turbulence, navigation or equipment issues, turn around or consider landing at the nearest airport for conditions to change. Set and exercise personal minimums (weather/winds/fuel burn etc.). As a student, you always had your instructor who would step in and call the shots. Now you have to be that person. Set personal minimums for weather, distance, fuel burn, and visibility before you fly. This way when you get into a sticky situation they won’t come as an afterthought. Come prepared. You don't want to be in the situation where you have to ask the busy ground controller where to taxi or what frequency to call because you were unprepared and did not use all your available information. Begin planning your day before you get to the airport. Before you arrive you should have an idea of what weather you will be facing for your route of flight for that day. Remember those pesky briefings you are supposed to get? Real pilots still get them. They include weather, NOTAMS, and any other pertinent information. Do not risk or fall into the temptation of flying in deteriorating fight conditions that will lead you into IMC. Follow this link for 9 more reasons why you shouldn't: http://www.boldmethod.com/blog/lists/2014/11/9-reasons-why-you-should-never-fly-vfr-into-imc/. Night flying and flying in smoky or hazy conditions, especially when back-lit by the sun can result in inadvertent instrument conditions. You must also keep in mind that weather forecasts are not always completely accurate. A falling cloud ceiling can put you in a bad position. As soon as you start to sense the weather making a turn for the worst, trust your training, stick to your instruments, and take the safest action. Do not fly for hire. The FAA has determined the minimum amount of experience and skills required to fly for hire is 250 hours. As a privet pilot you have a minimum of 40 and are not legally allowed to fly for hire. Aside from being under-qualified and inexperienced, you are putting property and lives at undue risk. If it falls on the wrong ears that you were flying for hire, your license and career are put at risk. Stick to your training and your checklist. We're human and everyone makes errors. The checklist is your safety net. Even if you have what you're supposed to do memorized, the checklist is there to for you to verify you've completed each item. Don't be fooled by the people who tell you professional pilots and the highest level pilots memorize their checklists. They do to an extent, but they also have completed the checklist so many times they truly know and remember which order items are done. Even still, the use of the checklist is so important that they are still required to verbally state each item and have the other crewmember verbally confirm the item is complete. The items listed above are considerations to take into account that will help you stay safe and fly like a pro. Sticking to your training, FAA regulations, and your comfort zone is the best practice. Most accidents and incidents are avoidable. Flying with your newly acquired license opens new opportunities, allows you to gain experience, and most of all allows you to have fun!